Like many lolitas, and females in general, I love to shop. It was especially nice today. Not too chilly and not too windy. So I decided to go for a longer walk than usual this afternoon. Turning down a street I hadn't explored yet, I found a quaint little shop that sells antique and antique looking items. 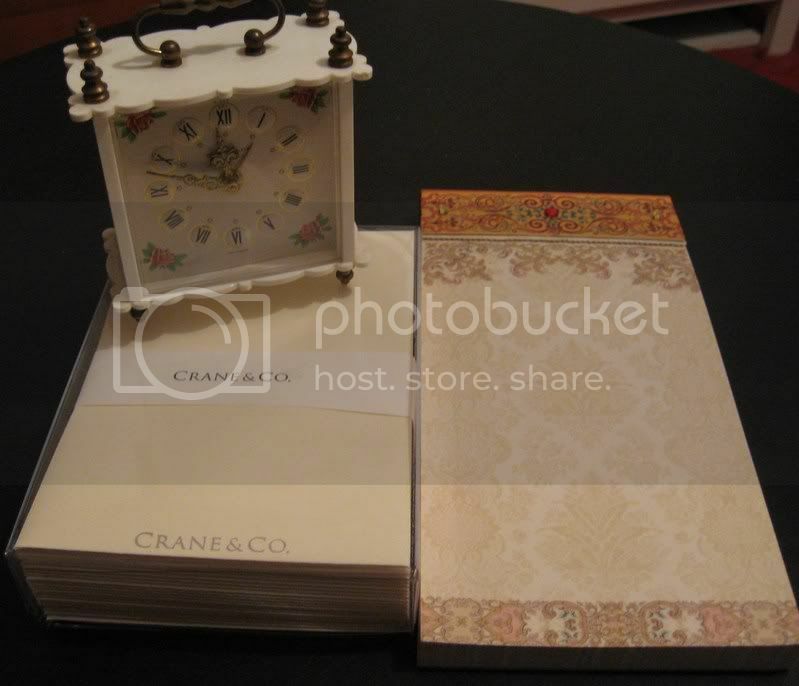 Taking a peak inside I saw this cute notepad and wind-up clock. I then stopped by staples on the return home to buy a pack of matching envelopes. ...I could not resist using the paper to write to a few of my penpals before I took the picture. The alarm clock is just so cute.♥ The areas around the numbers and the hands of the clock glow in the dark. The alarm is just the standard bell ringing noise. I feared that since the bells were internal they would have to be small and would not be loud. However, this tiny clock as the same noise level as any other wind up clock!